Georgia’s Former Interior Minister, one of the most influential figures of the United National Movement Ivane (Vano) Merabishvili, was transported to the hospital on August 15 due to the deteriorated health condition. As his lawyer told the media Merabishvili faced respiratory problems. "As far as I am informed he had respiratory problems. He cannot breathe properly, which causes other complications. I do not know the exact diagnosis,” Lawyer Giorgi Chiviashvili told the media. 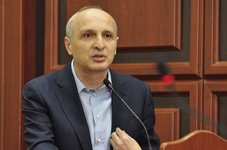 The Georgian Justice Ministry stated that the health condition of Merabishvili is satisfactory and his current condition poses no risks to his life and health. Stepan Tumanishvili, one of the lawyers of Merabishvili saw the former minister in prison on August 16 and said that now he feels brave and is undergoing medical treatment in the penitentiary establishment. The lawyer had been visiting Merabishvili in the penitentiary establishment for about an hour. “Doctors will check Merabishvili in prison,” Tumanishvili said. Merabishvili, who served as Prime Minister and Interior Minister of Georgia under the previous state leadership, was arrested in May 2013 after the current ruling Georgian Dream (GD) coalition defeated the former leading power, the United National Movement (UNM) party, in the 2012 parliamentary race. Merabishvili was charged for faking documents, misspending budgetary funds and alleged exceeding of power in connection with three different notorious cases. In February 2014, a Georgian court found Merabishvili guilty on the charge of exceeding his official power, and he was sentenced to four years and six months in prison. Merabishvili also claimed his pre-trial detention served the purpose of excluding him from the political life of the country, as he was appointed as Secretary General of the UNM after the 2012 parliamentary elections and intended to participate in the 2013 Presidential elections.